I have said it before and I will probably say it again, I have never been a fan of eggplant. That is until I made Dehydrator Eggplant Bacon and Crispy Coconut Eggplant Nuggets. The only exceptions in my book. 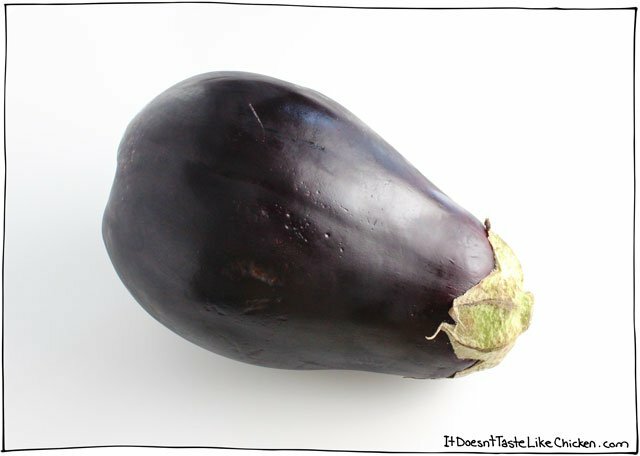 I don’t know what happened to me last night because either I just found one more exception to my eggplant rule or maybe I am actually starting to like eggplant… eek! 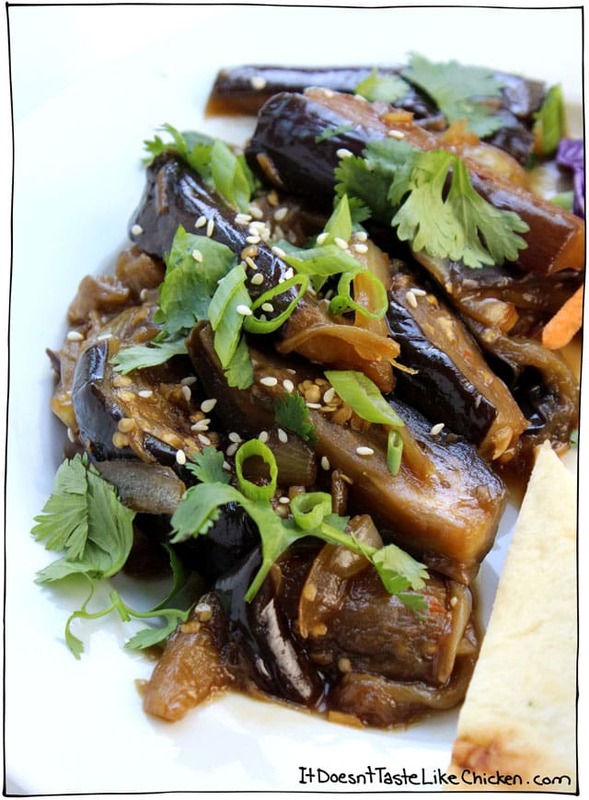 Whatever happened, I present you with Sweet Korean Eggplant. Sound familiar? 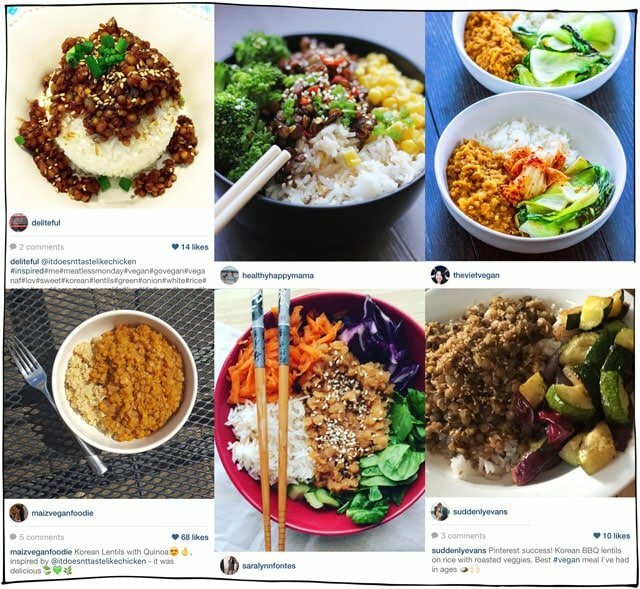 Ever since I posted my recipe for Sweet Korean Lentils a month ago, you guys have been totally obsessed. I have been getting tagged in pictures of your lentils on Instagram, snaps were sent to me via snapchat (follow bonappetegan), and I have been hearing rave reviews from friends and family. My own best friend has made lentils on repeat! Seriously, look at some of these gorgeous pictures you guys snapped. Made me drool all over my phone. So I decided to apply all the same flavours, to my least favourite vegetable. The result? I couldn’t stop eating it. 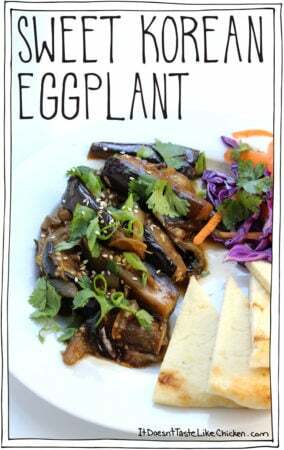 Another quick 20 minute recipe to make this soft, creamy, Korean BBQ inspired, sweet, tangy, gorgeous eggplant. Gah! I said it “gorgeous eggplant”. What is happening to me!? I swear I don’t recognize myself anymore. But seriously, did you see that picture. ↑↑↑ Yeah, you feel me. If you were a fan of the Sweet Korean Lentils, you will most likely be a fan of this. 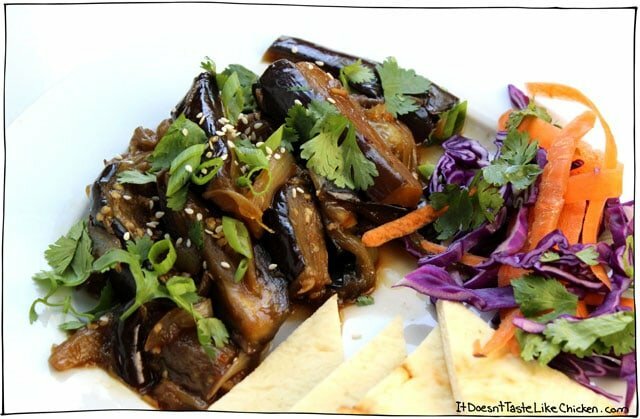 Sweet Korean Eggplant is excellent served on rice, alongside quinoa, in a taco, on top of some rice noodles, but I served it with some naan bread and a little slaw and throughly enjoyed it. (Is that too many cuisines in one?) Well, either way it was super tasty. 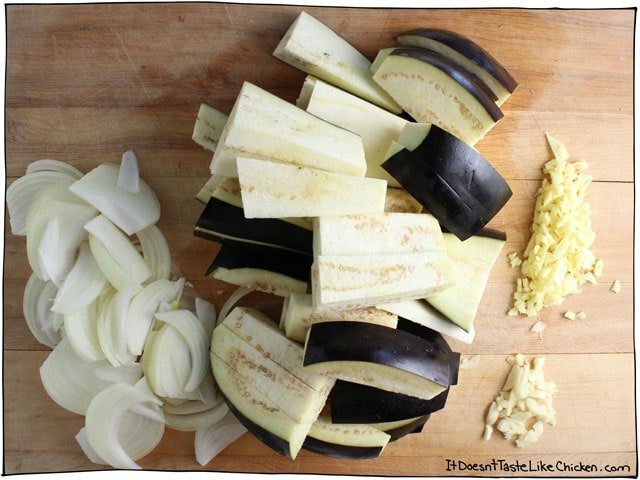 Slice your onion, mince the garlic and ginger, and cut the eggplant into thick strips about 1 to 2 inches wide and 4 inches long. These by no means have to be perfect, I’m just giving you a rough idea. Honestly, you could cut them into cubs if you like, but personally I enjoyed the longer slices. Now mix all you sauce ingredients together in a small bowl. Why do crushed red pepper flakes instantly make a bowl of sauce look gorgeous? 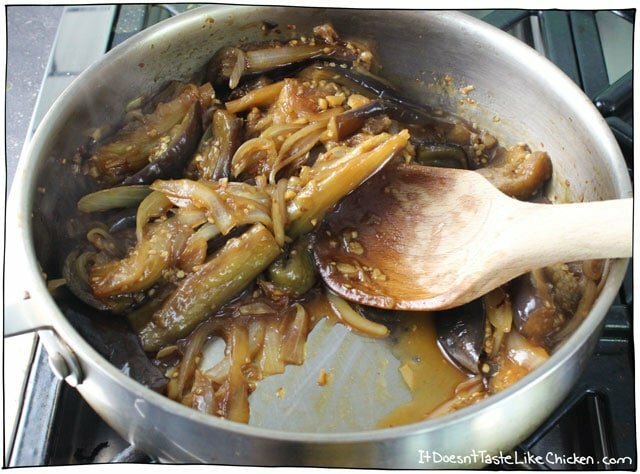 Sauté your onions for about 5 minutes and when they are tender and beginning to brown, add in all of the eggplant and your sauce. Cover and cook for about 10 minutes until the eggplant is soft and tender but still holds it’s shape, and most of the liquid is absorbed. 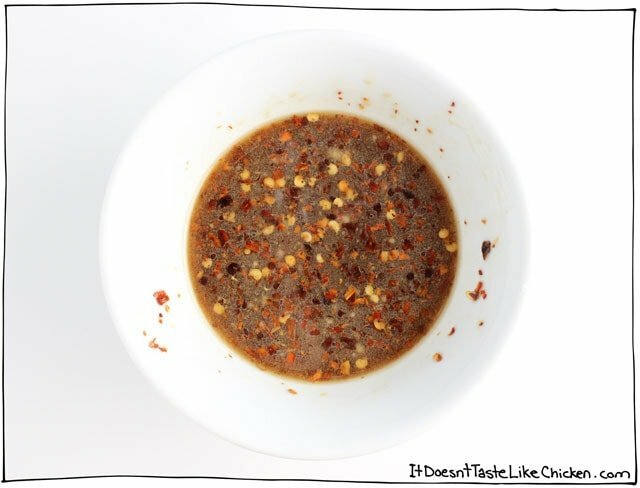 If the sauce gets a bit dry while your cooking, just splash in a bit more water as needed. Boom. Eggplant that actually tastes good. Easy and quick recipe, just 20 minutes.. Soft, creamy, Korean BBQ inspired, sweet, tangy, gorgeous eggplant. 1 eggplant, cut into thick strips, skinned if you prefer. In a small bow, mix together all the sauce ingredients. Heat the oil in a skillet over medium heat, then add the onion and sauté for a few minutes until the onion softens and begins to brown. Now add the eggplant and the sauce. Cover and simmer until the eggplant is cooked, tender and most of the liquid is absorbed, about 10 minutes. 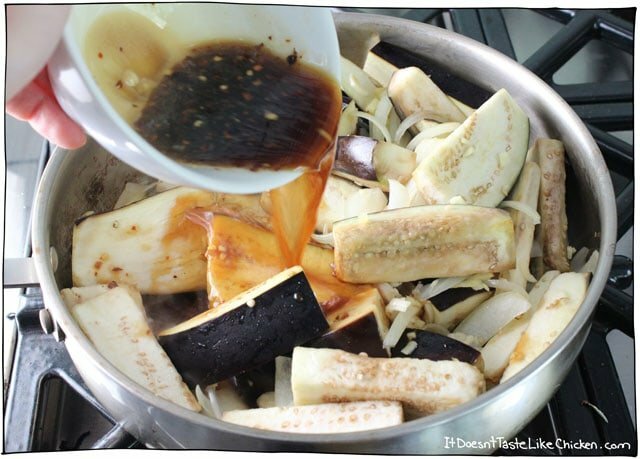 If the eggplant is getting a little dry while it cooks, just splash in more water if needed. Serve over rice, quinoa, on top of rice noodles, alongside some naan, or even in a taco! Garnish with green onions, cilantro and sesame seeds. 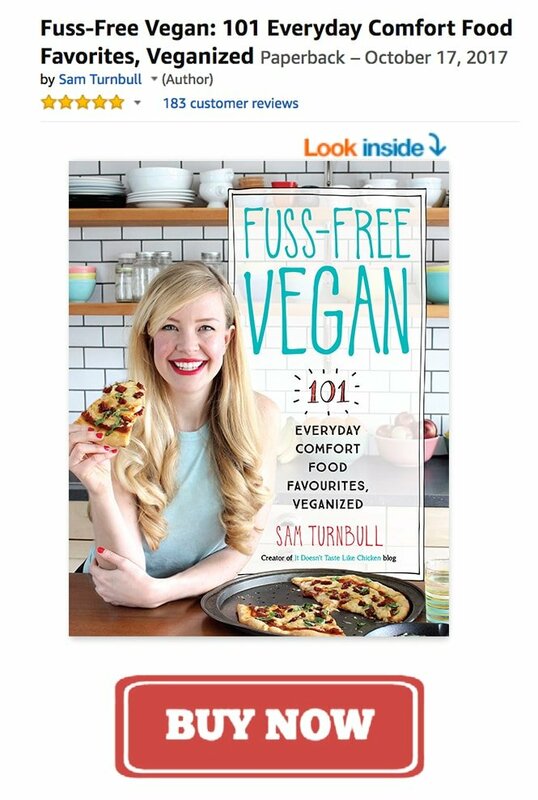 Your book is my absolute favourite recipe book. Every single recipe taken from this book or from your website has been delicious which is a first for me and I own many recipe books. I’ve only been a vegan for a few months and you’ve made cooking so much more enjoyable and I no longer resent cooking from scratch when I’m feeling tired or grumpy because I know the end result will be worth it. I loved this recipe!! And so many others, you Vegan Pho is to die for. My Family isn’t vegan, but I constantly offer to cook dinner (obviously vegan recipes), and am always coming back to your page because they love all your recipes!! Also my sister loves your name ‘it doesn’t taste like chicken’. I loathe eggplant and have only managed to find it somewhat appealing fried or covered in cheese. I bought it with hesitation to attempt the coconut nuggets but it’s so cold out we felt a bowl might be more satisfying. A quick search led to the idea of swapping these sweet little gems for the tofu in your Sticky Sriracha Bowl and..voila!…an amazing dinner for 2 eggplant haters in 20 minutes. And, we ate it all…which I still can’t believe. Thanks Sam! Love this! Made it tonight. So so good!! Thanks for yer another delicious korean inspired recipe! I added some tofu for some protein and it turned out very good!